Before we start, we need some basic concepts. The first is the idea of a feedback loop. We’re used to thinking in terms of linear sequences of cause and effect: A causes B, which causes C, and so on. However, our interactions with the world are rarely like this. More often, change tends to feed back on itself. For example, we identify a problem that needs solving, we take some action to solve it, and that action ends up changing our perception of the problem. The feedback usually comes in one of two forms. The first is a balancing feedback: The more you try to change something, the more the world pushes back and makes it harder. Take dieting for example: if we manage to lose a few pounds, the sense of achievement can make us complacent, and then we put the weight all back on again. The second form is a reinforcing feedback. This is where success feeds on itself. For example, perhaps we try a new exercise regime, and it makes us feel energized, so we end up exercising even more, and so on. In physics and engineering, these are usually called ‘positive’ and ‘negative’ feedback loops. I prefer to call them ‘reinforcing’ and ‘balancing’ loops, because it’s a better description of what they do. People tend to think ‘positive’ means good and ‘negative’ means bad. In fact, both types of loop can be good or bad, depending on what you think the system ought to be doing. A reinforcing loop is good when you want to achieve a change (e.g. your protest movement goes viral), but is certainly not good when it’s driving a change you don’t want (a forest fire spreading towards your town, for example). Similarly, a balancing loop is good when it keeps a system stable that you depend on (prices in the marketplace, perhaps), but is bad when it defeats your attempts to bring about change (as in the dieting example above). Of course, what’s good to one person might be bad to someone else, so we’ll set aside such value judgements for the moment, and just focus on how the loops work in the climate system. When the reinforcing loop dominates, sales grow exponentially. When the balancing loop dominates, sales stagnate. In this case, the natural limit is when everyone who might ever want an iPhone has one. Of course, in real life, the curves are never this smooth – other feedback loops (that we haven’t mentioned yet) kick in, and temporarily push sales up or down. However, we could hypothesize that these two loops do explain most of the dynamic behaviour of the sales of a new product, and everything else is just noise. In many cases this is true – diffusion of innovation studies frequently reveal this type of S-shaped curve. The structure of these two loops and the S-shaped curve they produce describe many real world phenomena: the spread of disease, growth of a population, the growth of a firm, the spread of a forest fire. In each case, there may well be other feedback loops that complicate the picture. But the underlying story about growth and its limits still captures a basic truth: exponential growth occurs when there is a reinforcing feedback loop, and as nothing can grow exponentially forever, there must always be a balancing loop somewhere that provides a limit to growth. The temperature of the planet is determined primarily by the balance between the incoming energy from the sun and the outgoing energy lost back into space. The incoming energy is in the form of shortwave radiation from the sun, and the amount we get is determined by the solar constant (which, of course, is not really constant, although the variations were too small to measure before the satellite era). The incoming energy from the sun, averaged out over the surface of the earth, is about 340 watts per square meter. If this is greater than the outgoing energy, the imbalance causes the earth to retain more energy, and so the temperature rises. As a warmer planet loses energy faster, this increases the outgoing radiation, which in turn reduces the imbalance again (i.e. this is a balancing loop). Imagine there’s an overshoot – i.e. the outgoing radiation rises, but goes a little too far, so that it’s now more than the incoming solar radiation. This reduces the net radiative forcing so far that it becomes negative. But a decrease in net radiative forcing tends to cause a decrease in energy retained, which causes a decrease in temperature, which causes a decrease in outgoing radiation again. So the balancing loop also cancels out any overshoot sooner or later. In other words, the structure of this loop always pushes the planet to find a (roughly) stable equilibrium: essentially, if the incoming and outgoing energy ever get out of balance, the temperature of the planet rises or falls until they are balanced again. Note that we could tell this is a balancing loop, without tracing the effects, just by counting up the number of “-” links. If it’s an odd number, it’s a balancing loop; if it’s even (or zero), it’s a reinforcing loop. In my systems thinking class, we play a game that simulates different kinds of loop, with each person acting as one link (some are “+” links, some are “-” links). The students usually find it hard to predict how loops of different structure will behave, but once we’ve played it a few times, everyone has a good intuition for the difference between reinforcing loops and balancing loops. There is one more complication for this loop. The net radiative forcing determines the rate at which energy is retained, rather than the total amount. If the net forcing is positive, the earth keeps on retaining energy. So although this leads to an increase temperature, and, if you follow the loop around, a decrease in the net radiative forcing, it will reduce the rate at which energy is retained (and hence the rate of warming), it won’t actually stop the warming until the net radiative balance falls to zero. And then, when the warming stops, it doesn’t cool off again – the loop ensures the planet stays at this new temperature. It’s a slow process because it takes time for the planet to warm up. For example, the oceans can absorb a huge amount of energy before you’ll notice any increase in temperature. This means the loop operates slowly. We know from simulations (and from studies of the distant past) that it can take many decades for the planet to find a new balance in response to a change in net radiative forcing. This loop, on its own, cannot produce a runaway global warming (or cooling) – the earth will eventually find a new equilibrium in response to a change in net radiative forcing. More precisely, for a runaway warming to occur, some other reinforcing loop must dominate this one. As I said, there are some reinforcing loops, and they complicate the picture, but nobody has managed to demonstrate that any of them are strong enough to overcome the balancing effect of this loop. The balancing loop has a delay, because it takes a lot of energy to warm the oceans. Hence, once a change starts in this loop, it takes many decades for the balancing effect to kick in. That’s the main reason why we have to take action on climate change many decades before we see the full effect. On human timescales, the earth’s natural balancing mechanism is a very slow process. If we make a one-time change to the radiative balance, the earth will slowly change its temperature until it reaches a new balance point, and then will stay there, because the balancing loop keeps it there. However, if there is some other force that keeps changing the radiative balance, despite this loop’s attempts to adjust, then the temperature will keep on changing. Our current dilemma with respect to climate change isn’t that we’ve made a one-time change to the amount of greenhouse gases in the atmosphere – the dilemma is that we’re continually changing them. This balancing loop only really helps once we stop changing the atmosphere. I agree that it is good to think about the climate system in the manner of system dynamics, and also that the first example should be the outgoing radiation in the energy balance model. I have a minor complaint about a piece of terminology. I know that the terms “reinforcing feedback” and “balancing feedback” are used in Donella Meadows’ “Thinking in Systems”, and they are good at avoiding misunderstanding about “positive” and “negative”. Still I think, though very unfortunately, “balancing” is also misleading. Newcomers may think that it is something to do with the energy balance, or with the balance of mechanical forces (for we also use the term “dynamics”). If we tentatively thinking in the way of linear models, what is reinforced by reinforcing feedbacks is perturbations, not the basic state. I think that the opposite one should be named in the common concept, so my suggestion is “attenuating feedback”. Another possible word is “stabilizing”, but this seems to refer to the basic state rather than the perturbation, and this may lead to confusion about so many kinds of instabilities in meteorology and oceanography. The “counting the number of – links” trick only works if the effects of each link are comparable. 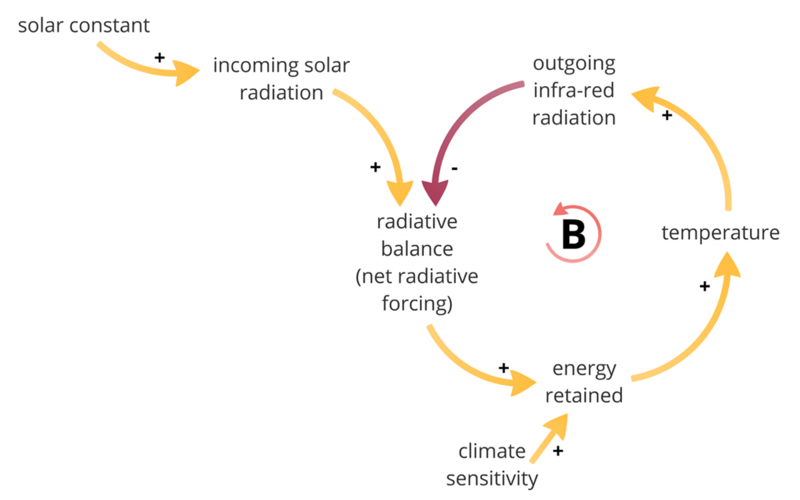 In the energy balance diagram, for instance, you *could* have runaway heating if the outgoing radiation was not enough to compensate for the incoming solar radiation. @Jorge: Good point. It’s important to check the relationships quantitatively, to make sure the qualitative reasoning holds up. 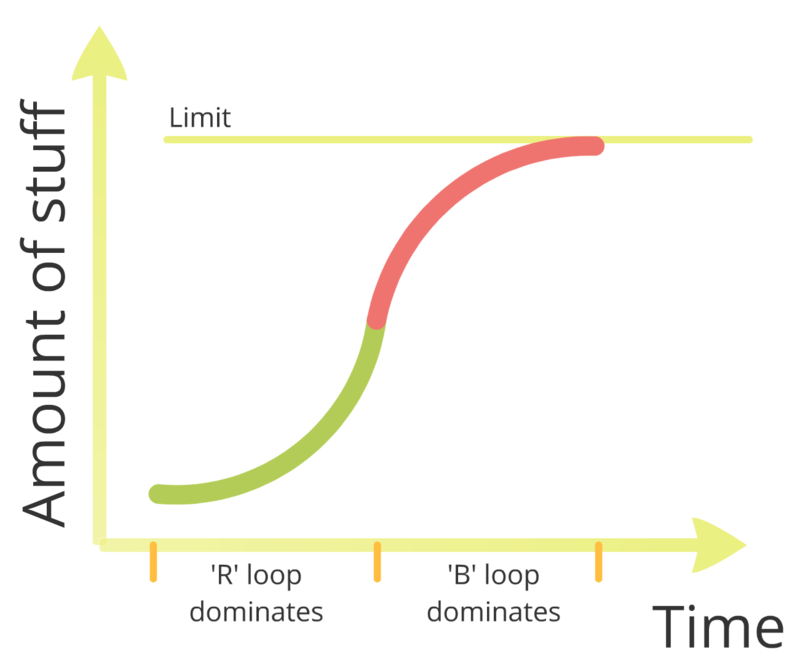 For this loop, we’re okay because the outgoing radiation is related to the fourth power of the temperature, according to the Stefan-Boltzmann equation. That guarantees this loop balances. @Kooiti: Hmmm. Now I have to think more about terminology. We could call them “accelerating” and “decelerating” loops, to emphasize the idea that they affect rates of change….